Old Company Stock Research Service / RM Smythe is the successor to the archives, publishing rights and copyrights on obsolete research reference material published by the RM Smythe, Marvyn Scudders Manuals, the Robert D. Fisher Manuals, and the Herzog & Co., Inc. obsolete research services, which have performed expert old stock research services continuously since 1880. 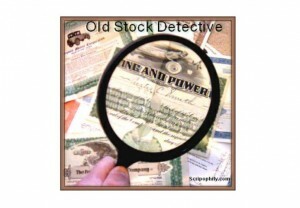 Scripophily.com Old Company Research is the World’s #1 Stock & Bond Research Firm. We’ll help you find information on your stock and bond certificates and then tell you how to redeem them. We also buy and sell collectible stock and bond certificates. The resources used in determining your research report includes our large proprietary library of old company stock and bond research performed during the past 140 years which includes information from the Marvyn Scudders Manuals, the Robert D. Fisher Manuals, and the Herzog & Co., Inc’s obsolete research service reports, and other reliable sources. Our company is the world’s leading provider of Old Stock and Bond Research Services and we are the successor to all material published by the Marvyn Scudders Manuals, the Robert D. Fisher Manuals, and Herzog & Co., Inc. obsolete research services, which have been performed continuously since 1880. February 24, 2018 in Articles, Communications, Mining, Oil and Gas, Other, Railroads, Scripophily News. Public Relations will be headed by Bob Kerstein, CPA, CGMA and Membership will headed by Robin Majlak. The International Bond & Share Society (IBSS) is a worldwide association of people interested in the study and collecting of stock and bond certificates, a hobby called Scripophily. The society was founded in 1978 as a non-profit organization with the goal to promote, encourage and develop all aspects of scripophily. The IBSS has members all over the world and is funded by its members. The IBSS website is located at Scripophily.org. “We are all very excited to add both Bob and Robin to our leadership team” said Martin Zanke, Chairman of the International Bond & Share Society. Their business experience over the last 40 years has been very impressive and we look forward to contributions in adding value to our organization” added Zanke. Robin Majlak works for Roland & Co. a company based in Southport, Connecticut. She became involved in Scripophily in 2008 when she began working for John & Diana Herzog, longtime collectors and previous owners of R. M. Smythe & Co., dealers and an auction house. Robin’s work with the Herzogs included cataloging their personal collections and items of the former Smythe inventory. Robin became interested in the history & beauty of the stock and bond certificates, and autographs. Robin’s education and previous career was in the legal field where she worked as a real estate paralegal which included preparing all closing documents for a transfer of ownership before starting her position with the Herzogs. Robin has three children and a Wire Hair Fox Terrier. Roland & Co. sells its inventory on http://www.rolandandco. as well as on eBay. Bob Kerstein, CPA, CGMA is the Founder and CEO. of Scripophily.com L.L.C. and OldCompany.com. Bob has been a Certified Public Accountant since 1978. Bob is also a Chartered Global Management Accountant (CGMA), a member of the California Society of Certified Public Accountants, Virginia Society of Certified Public Accountants, and the American Institute of Certified Public Accountants. Bob has more than 46 years of senior management experience as a Financial Executive in the Cellular, Cable TV, Satellite, Internet, Professional Sports and Entertainment Industries. He is the President of the Professional Scripophily Traders Association (PSTA) and Co-founder of Scripophily USA. He had worked as a Chief Financial Officer and in other capacities for both Public and non Publicly held companies prior to founding Scripophily.com and Old Company Research. He has experience in the communications and entertainment industries including Cellular, Satellite Communications, Internet Development, Cable TV, Motion Pictures and Professional Sports. Senior positions held by Kerstein include Cellular Chief Financial Officer and Senior Vice President at McCaw Cellular Corporation (Now AT&T Wireless), Chief Financial Officer at American Mobile Satellite Corporation, Chief Financial Officer at Falcon Cable TV, Director of Financial Reporting at Warner Brothers and Chief Information Officer at Orca Bay Sports and Entertainment (owners of the Vancouver Canucks and Grizzlies). The IBSS has members all over the world and is funded exclusively by the members. The society publishes Scripophily Magazine three times a year (for a sample issue press here) offers guest speakers for special occasions. The International Bond & Share Society members include attorneys, doctors, airline pilots, certified public accountants, college professors, pastors, financial professionals and much more. Some of the organization’s members are involved with local programs helping students better understand stocks and bonds, and the financial markets. The membership has also partnered with the Museum of American Finance, an affiliate of the Smithsonian Institution, on an educational program to place primary source documents in local classrooms. The program is called Sharing Stocks and was founded in 2016. To become a member of the IBSS, please click here. Benefits include access to all of the online resources available to members only: an online forum where you can contact experts to answer questions about your old stocks and bonds and build relationships with fellow collectors, galleries of rare and beautiful Scripophily pieces, and news about the society. Subscription to our “SCRIPOPHILY” magazine with free ads for collectors (3 issues per year). Selling and buying at the IBSS’ regular exclusive mail bid auctions at low commission. Online and print opportunities for publishing your favorite Scripophily subjects. But most important is making connections with other people who share common interests. Membership in the IBSS will greatly enhance enjoyment of the hobby. February 22, 2018 in Articles, New Items, Scripophily News. ….Bob has a strong background in accounting and in the internet business. He is a Certified Public Accountant and has been the Chief Financial Officer of several publicly held communications companies. As Chief Information Officer of the Vancouver Grizzlies and Vancouver Canucks he was responsible for the first team websites in the National Basketball Association (NBA) and the National Hockey League (NHL). During the dot.com hype he was involved in the founding of several related enterprises. When the first internet bubbles blew off on the stock market he was the first to have the stock certificates in his hands. For the US media he is the expert to ask about hidden treasures behind old financial documents or these papers as collectables…. February 14, 2018 in Articles, New Items, Scripophily News. 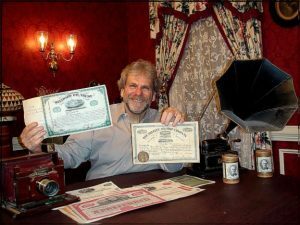 The 17th Annual International Stock and Bond Show in Herndon, Virginia had another successful show with thousands of historical and artistic stock and bond certificates, autographs, paper money documents, and much more. The show had dealers from all over the United States and from Germany. The show also included a strong presence from the International Bond & Share Society (IBSS) with the Chairman, Martin Zanke, USA Chapter President & Treasurer – Max D. Hensley, Committee Member, Andreas Reineke, Webmaster – Tim Welo and Public Relations Director, Bob Kerstein. The show also was attended by the co-founders of The American Stock and Bond Collectors Association, Scott Winslow and Bob Kerstein. One of the highlights of the show was a 45 minute presentation by Bill Knadler (Fireman Bill) on the Stocks and Bonds of Ohio. The presentation was organized by the International Bond & Share Society. More details about the presentation will be included in the next edition of the IBSS publication, SCRIPOPHILY. The publication is sent to all members of the IBSS. To join the IBSS, please go to http://scripophily.org/membership/. The show was managed by Bob Schell and it was located at the Crowne Plaza Hotel near Dulles Airport which. Next years show will be at the same location on January 25-26, 2019, and will include dealers specializing Scripophily, Stock, Bond and Paper Money and Autographs. OldCompany.com / RM Smythe Stock Research Service offered Free Old Stock Certificate Research Services to anyone who brought in a certificate and wanted to know what happened to the company. Scripophily (scrip-ah-fil-ly) is the name of the hobby of collecting old stock and bond certificates. Certificate values range from a few dollars to more than $1,000,000 for the most unique and rare items. Tens of thousands of Scripophily buyers worldwide include casual collectors, corporate archives, business executives, museums and serious collectors. Due to the computer age, more and more stock and bonds are issued electronically which means fewer paper certificates are being issued. As a result, demand for paper certificates is increasing while supply is decreasing. Scripophily.com has had items on loan for display in the Smithsonian’s Museum of Financial History in New York and has also partnered with the Museum of American Finance on stock giveaways for New York area teachers and students. Scripophily,com has been featured on CNBC, USA Today, Associated Press, Reuters, Nightline, Today Show, Baltimore Sun, and Washington Post and in many other media publications. Scripophily.com offers the World’s #1 old stock research service at OldCompany.com and offers high resolution scans for publications and has over 16,500 selections on its website. Scripophily.com/Old Company Research Service, founding member of the Old Stock Exchange, is the successor company to all material published by the Marvyn Scudders Manuals, the Robert D. Fisher Manuals, R.M. Smythe Stock Research Service, and the Herzog & Co., Inc. obsolete research services. These services have been performed continuously for over 138 years since 1880. We are the leading provider of authentic stock certificates, autographs, and old company stock research services. Scripophily.com and Old Company Research Services was founded by Bob Kerstein (Bob.com). Bob is a CPA and CGMA, and has more than 42 years of senior management experience in the Cellular, Cable TV, Satellite, Internet, Professional Sports and Entertainment Industries. Bob is also the President of the Professional Scripophily Traders Association (PSTA). February 13, 2018 in New Items, Scripophily News. The Washington Post is currently featured in the movie “The Post” with Meryl Streep staring as Post publisher Katharine Graham. The Post published the Pentagon Papers in 1971 when Katharine Graham risked their IPO over what she felt was fake news being presented by the U.S, Government regarding the Vietnam War. Beautiful engraved stock certificate from the Washington Post Company issued in 1971. This historic document was printed by American Bank Note Company and has an ornate border around it with a vignette of the capitol building and President George Washington. This item has the printed signatures of the Company’s President, Katharine Graham and Secretary, Alan Fineburg and is over 47 years old. “The Post” film takes place in 1971 and chronicles how The Washington Post defied the Nixon administration to publish news accounts based on the Pentagon Papers, a secret government study about the Vietnam War. This beautifully engraved stock certificate is from the Washington Post Company and was printed by American Bank Note Company with an ornate border around it with a vignette of the capitol building. This item has the printed signatures of the Company’s President, Katharine Graham and Secretary, Alan Fineburg and is over 47 years old. The Washington Post Company history dates back to 1877, when the Post was first published. The Washington Post Company was incorporated in the District of Columbia in 1889, and remained a District of Columbia corporation until it changed its state of incorporation to Delaware in 2003. It was a company, trading on the New York Stock Exchange that went public in 1971. The company is headquartered in Washington, D.C. near the corporate offices of Scripophily.com. The newspaper’s slogan is, “Democracy dies in darkness”. Daily editions are printed for the District of Columbia, Maryland, and Virginia. The newspaper has won 47 Pulitzer Prizes. In the early 1970s, in the best-known episode in the newspaper’s history, reporters Bob Woodward and Carl Bernstein led the American press’ investigation into what became known as the Watergate scandal; reporting in the newspaper greatly contributed to the resignation of President Richard Nixon. In 2013, its longtime controlling family, the Graham family, sold the newspaper to billionaire entrepreneur and Amazon.com founder Jeff Bezos for $250 million in cash. The newspaper is owned by Nash Holdings LLC, a holding company Bezos created for the acquisition. Katharine Graham (Kay Graham) was one of the most powerful women in American media. Her mother, Agnes Meyer, was an educator and her father, Eugene Meyer, was a publisher. He purchased The Washington Post in 1933, and Katharine Meyer began working for the Post five years later. She married Philip Graham in 1940, and in 1945 left the Post to raise her family. In the next few years Philip Graham became publisher of the Post and bought out Eugene Meyer’s voting stock. During this time the Washington Post Company also acquired the Times-Herald and Newsweek magazine. From 1973-1991 Graham, known to many as “Kay,” was board chairman and chief executive officer of the Washington Post Company, and remained Chairman of the Executive Committee until her death. Under Katharine Graham’s leadership, The Washington Post became known for its hard-hitting investigations, including the publication of the secret Pentagon Papers against the advice of lawyers and against government directives, followed by the Woodward and Bernstein investigation of the Watergate scandal. For these reasons, she and the newspaper are sometimes credited with bringing about the fall of Richard Nixon. Our company has been featured on CNBC, USA Today, Associated Press, Reuters, Nightline, Today Show, Baltimore Sun, and Washington Post and in many other media publications. Scripophily.com has items on display in museums around the world. 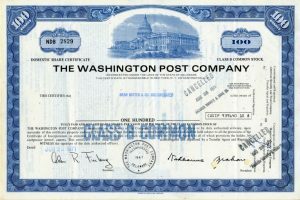 Scripophily.com has partnered with The Museum of American Finance, an affiliate of the Smithsonian Institution, with an educational program, Sharing Stocks, to place primary source documents in local classrooms. Scripophily.com (OldCompany.com) and Scott J. Winslow Associates, Inc. have sponsored free stock certificates for social studies teachers throughout the New York area. Scripophily.com /Old Company Research Service, founding member of the Old Stock Exchange, is the successor company to all material published by the Marvyn Scudders Manuals, the Robert D. Fisher Manuals, R.M. Smythe Stock Research Service, and the Herzog & Co., Inc. obsolete research services. These services have been performed continuously for over 138 years since 1880. We are the leading provider of authentic stock certificates, autographs, and old company stock research services. Scripophily.com and Old Company Research Services was founded by Bob Kerstein (Bob.com). Bob is a CPA and CGMA, and has more than 42 years of senior management experience in the Cellular, Cable TV, Satellite, Internet, Professional Sports and Entertainment Industries. Bob is also the President of the Professional Scripophily Traders Association (PSTA), Co Founder of ScripophilyUSA.org and a member of the International Bond and Share Society. January 31, 2018 in Articles, New Items, Other, Scripophily News. Dealers from all over the world and collectors who are interested in Scripophily will be attending the 17th Annual International Stock and Bond Show in Herndon on January 26 and 27 at the Crowne Plaza Hotel near Dulles Airport on 2200 Centerville Road. 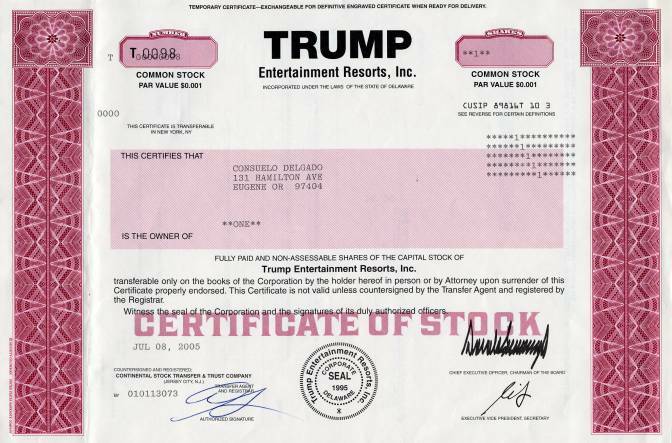 “If anybody has stock certificates, they can bring them to find out their value. People have them and don’t know they may have a value,” said Bob Kerstein, the “Old Stock Detective” and founder of Scripophily.com. The show will have thousands of historical and artistic stock and bond certificates, autographs, paper money documents, and much more. Scripophily (scrip-ah-fil-ly) is the hobby of collecting old stock and bond certificates. Certificate values range from a few dollars to more than $500,000 for the most unique and rare items. Tens of thousands of Scripophily buyers worldwide include casual collectors, corporate archives, business executives, museums, and serious collectors. Due to the computer age, more stocks and bonds are being issued electronically, which means fewer paper certificates. As a result, demand for paper certificates is increasing while supply is decreasing. “This is the only show in the country that specializes in stocks and bonds and is managed by the world famous Bob Schell. We will be offering Free Old Stock Certificate Research Services ($39.95 Value) to anyone who brings in a certificate to our booth and wants to know what happened to the company. The research service is called OldCompany.com and the services have been performed continuously since 1880,” said Mr. Kerstein. There are many factors that determine the value of a certificate. “Collectability comes first. What makes it desirable? The historical significance: like being issued by a significant company or a famous person. Also, the beauty of a graphic picture and if it is really rare are other factors. Stock certificates make great gifts and wonderful collectibles especially when they are historically relevant,” Kerstein explained. The Crowne Plaza Hotel near Dulles Airport on 2200 Centerville Road (call 800-227-6963). January 22, 2018 in New Items, Scripophily News. January 7, 2018 in New Items. 1. Sharing Stocks: Historic certificates for Education. December 1, 2017 in Articles, New Items, Other, Railroads, Scripophily News. Samuel Prescott Bush was the President of Buckeye Steel Castings. He is the Grandfather of President George H. W. Bush, and the Great Grandfather of President George W. Bush and Governor Jeb Bush. 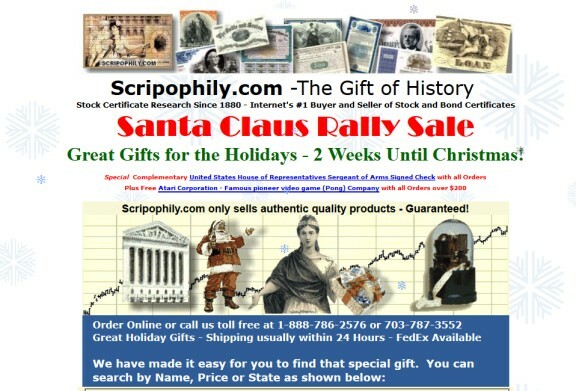 Scripophily.com ®, the Internet’s largest buyer and seller of collectible stock and bond certificates, is is offering free shipping and a Seatrain Lines. 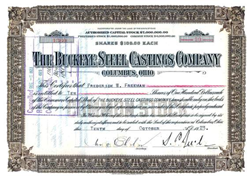 stock certificate with all orders plus a free Buckeye Steel Castings Inc stock certificate signed by George Bush’s Grandfather with all orders over $200. Samuel P. Bush ( Samuel Prescott Bush b. 1863. d. 1948) was the President of the Buckeye Steel Castings Co. in Columbus, Ohio, makers of railcar parts from 1907 – 1927. His entire career had been in the railroad business– supplying equipment to the Wall Street-owned railroad systems. Samuel Prescott Bush, was a close adviser to President Hoover. Samuel P. Bush was also the first president of the National Association of Manufacturers. Samuel Prescott Bush was a member of the Stevens Institute of Technology class of 1884. Bush was on the varsity football and baseball teams, and belonged to the tennis club and served a term as a director of the Stevens Athletic Association, all while earning his bachelor’s degree. In the early 1890s, Bush assisted Ohio State football coach Jack Ryder and helped organize an amateur baseball league in Columbus – – he played second base on the Pennsylvania Railroad Columbus Shop team. In 1892 he and two others organized one of Columbus’s first tennis clubs. Later, as a charter member of the Scioto Country Club in that city, he chaired the club’s golf- course construction committee. Bush, who died in 1948, was a noted industrialist — railroads and steel were his businesses — who also performed extensive civic and community service. Stevens recognized that service in 1947 by awarding him an honorary – degree of doctor of engineering. Samuel is the Grandfather of President G. W. Bush, the Father of Prescott S. Bush (Prescott Bush, was a senator and the tallest man in the Senate for many years) and the Great Grandfather of President George W. Bush and Governor Jeb Bush. Samuel married Flora Sheldon, daughter of Robert Emmet Sheldon and Mary Elizabeth Butler, on 20 Jun 1894 in Columbus, OH. The company also offers the World’s #1 old stock research service at OldCompany.com and offers high resolution scans for publications. Scripophily.com has over 16,500 selections on its website. Scripophily.com /Old Company Research Service, founding member of the Old Stock Exchange, is the successor company to all material published by the Marvyn Scudders Manuals, the Robert D. Fisher Manuals,R.M. Smythe Stock Research Service, and the Herzog & Co., Inc. obsolete research services. These services have been performed continuously for over 137 years since 1880. We are the leading provider of authentic stock certificates, autographs, and old company stock research services. Scripophily.com and Old Company Research Services was founded by Bob Kerstein (Bob.com). Bob is a CPA and CGMA, and has more than 41 years of senior management experience in the Cellular, Cable TV, Satellite, Internet, Professional Sports and Entertainment Industries. Bob is also the President of the Professional Scripophily Traders Association (PSTA). November 28, 2017 in New Items. Old Company Research is the successor to RM Smythe Stock Research Service and is the publisher of all material of the Marvyn Scudders Manuals, the Robert D. Fisher Manuals, R.M. 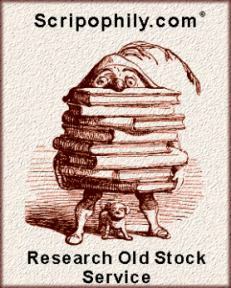 Smythe stock research archives, and the Herzog & Co., Inc. obsolete research services. 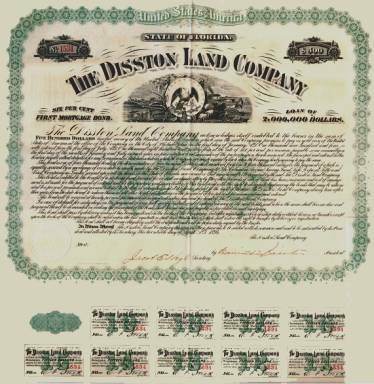 Professional researching of old stock and bond certificates provides information in determining redeemable worth as a financial security and collectible value. Old Stock Certificates may have value and should always be investigated before they are disposed. 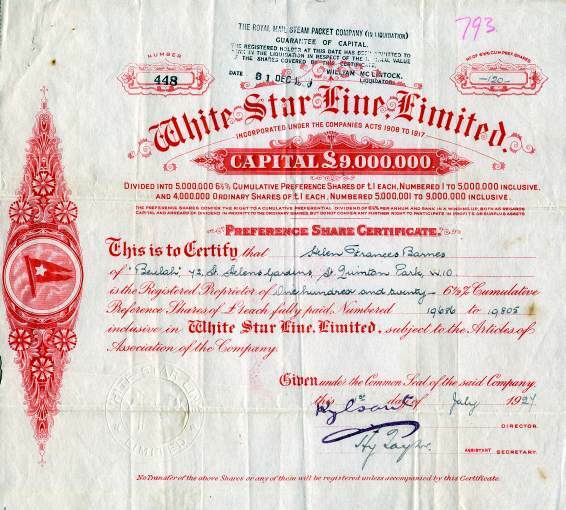 An old stock or bond certificate may still be valuable even if it no longer trades under the name printed on the certificate. Old Company Research Service (OldCompany.com) is celebrating 137 years of continuous old stock and bond research services. The service was founded in 1880 by Roland M. Smythe and was later expanded with the addition of Marvyn Scudder and Robert D. Fisher. In 2011, Scripophily.com, the parent company of Old Company Research Service, acquired the old stock & bond business research service correspondence, archives and copyrights from Herzog & Co., Inc. (formally R.M. Smythe Old Stock Research Services). The acquisition included all reference material published by the Marvyn Scudders Manuals, the Robert D. Fisher Manuals, and Herzog & Co., Inc. Since the acquisition, we have successfully integrated the archives, repositories and resources into our proprietary information management systems. Under the direction of trained old stock research professionals, the data merger has ensured our continual commitment to quality and value with efficient access to this previously hard to recover information for a cost effective price. The old company and securities research service provides investigative analysis for financial and accounting firms, professionals, attorneys, investors, estates and trusts in cases of questioned securities and lost company identities. The research investigations will probe into the corporate history, capital changes, mergers, acquisitions, bankruptcies, legal proceedings, regulatory filings, and analysis of companies to assess the disposition of financial holdings. In addition to the potential redeemable value sought by investors, Scripophily.com offers insight into the secondary historical finance market by assessing any possible collectible value. SCRIPOPHILY is the hobby of collecting authentic old stock and bond certificates. The name resulted from the combining of the English and Greek words “scrip” represents an ownership right and the word “philos” meaning to love. 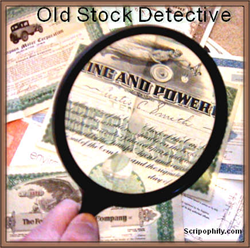 Scripophily.com is the Internets leading buyer and seller of collectible stock and bond certificates, and old stock research at OldCompany.com. 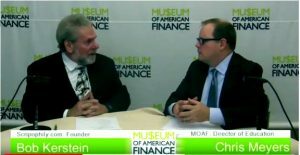 The company has had items on display in the Museum of American Finance in New York, an affiliate of the Smithsonian Institution. Scripophily.com has been featured on CNBC, Today Show, Inside Edition, Associated Press, USA Today, Baltimore Sun, Washington Post and in many other media publications.. Our online store has over 17,500 selections including categories such as Frauds, Scandals, Bankruptcies, Dot Coms, as well as the traditional American industries. Scripophily.com /Old Company Research Service, founding member of the Old Stock Exchange, is the successor company to all material published by the Marvyn Scudders Manuals, the Robert D. Fisher Manuals, R.M. Smythe Stock Research Service, and the Herzog & Co., Inc. obsolete research services. These services have been performed continuously for over 137 years since 1880. We are the leading provider of authentic stock certificates, autographs, and old company stock research services. For more information on Scripophily.com®, visit https://www.scripophily.com, https://www.oldcompany.com, https://www.scripophily.net, http://www.rambo.com, http://www.bob.com or call 1-703-787-3552.